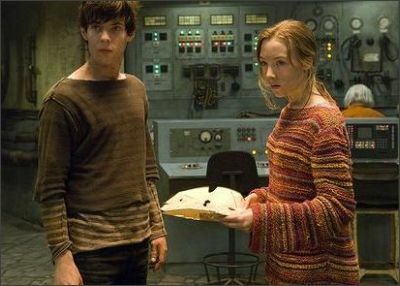 The story centers on two teenagers, Lina Mayfleet (Saoirse Ronan) and Doon Harrow (Harry Treadaway). We meet them on their Assignment Day when their entire future careers get determined by the luck of the draw. Doon is supposed to become a messenger, but he trades that choice job away to Lina in return for a chance to work under the city and gain access to the generator that supplies the lifeblood of Ember: electricity. Because Ember lies deep below the ground, safe from the terror that took place 241 years ago. Without the generator the entire population would be plunged into total darkness and the electric lights mounted all over the city is there only refuge from the abyss beyond. But lately, the lights have begun to flicker. Lina is delighted to become a messenger and dives into her duties with gusto. She is the grownup in her tiny family, which consists of a little sister named Poppy with a propensity for putting things in her mouth and a dear (though slightly crazy) grandmother who spends her days taking thread out of clothing and spooling it for reuse (no on has had new clothes for over a century). In the depths of a closet, Poppy uncovers a mysterious metal box that had belonged to a former mayor and proceeds to gnaw on the contents. Lina recognizes the writing on the pages as coming from the revered and little understood “builders” who created Ember and, with the help of Doon, attempts to recreate the documents from the chewed mess. To their shock and amazement, they seem to be telling of a way out of Ember, and out of the danger of starvation and perpetual darkness. Can Lina and Doon overcome the rampant corruption in their government to discover the truth and lead the citizens of Ember to salvation? 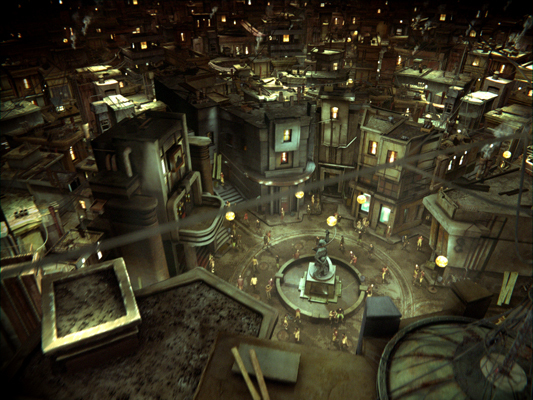 ۞ The movie is based on a novel called The City of Ember that was released in 2003. You can read an interview with the author here about the novel’s tenth anniversary this year. ۞ DuPrau wrote 2 sequels, The People of Sparks (2004) and The Diamond of Darkwood (2008), as well as a prequel called the Prophet of Yonwood (2006) that tells of the cause of the apocalypse that led to the building of Ember. 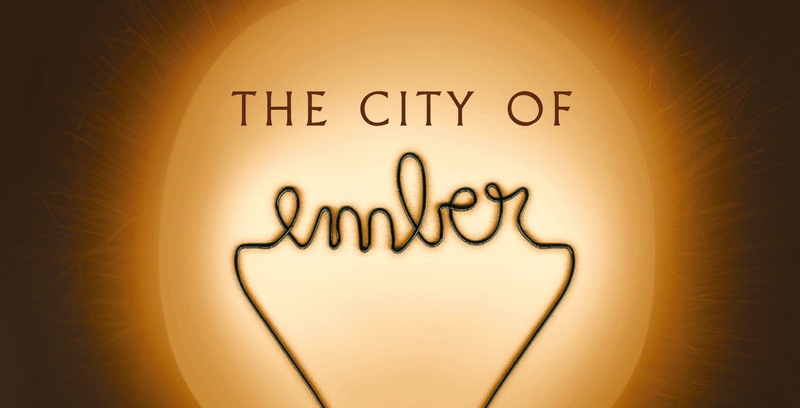 ۞ The City of Ember was made into a graphic novel in 2012 by Niklas Asker. ۞ Harry Treadaway (Doon), most recently appeared in the 2013 Lone Ranger with Johnny Depp. Saoirse Ronan (Lina) has lent her voice as well as her face to several films and is best known for her roles in Atonement and The Lovely Bones. ۞ The film includes a few major changes from the book. First off, giant mutated animals. In the book, Doon keeps a caterpillar to observe it and is utterly fascinated by insects because the people of Ember never see things from above ground. In the film he finds a moth is easily 2 feet across, upping the visual ante but not staying true to the novel. There is also a completely terrifying star nosed mole as large as a hippopotamus that delivers the come-uppence to Ember’s corrupt mayor (played by Bill Murray), which never appeared in the book. Likely this is a reference to the nuclear cause of the apocalypse in the Prophet of Yonwood and mutations that could follow. Personally, I did not like the change, I thought the book was already great without the novelty. ۞ The other big change, which is probably the reason the movie ends up in Steampunk lists and the book does not, is the amount of gadgetry. In the movie, Doon’s father (Tim Robbins) is an inventor and Rube Goldberg type machines cook their breakfast, while in the book he runs a shop populated by old shoe heels and rusty nails. There are also scenes that take place in the huge industrial center under the city, but the tech is all there to create electricity so it is not very Steampunk in the end. But the gritty, dark ambiance and added mechanical gizmos definitely make you feel like you are in the past rather than the distant future. ۞ The set was built in the same shipyard the Titanic was, and many of the interiors that were built were never used in a single shot but add to the depth of the visual story. Check out the clips below the gallery for more windows into the underground city. This entry was posted on December 11, 2013 by Phoebe Darqueling. It was filed under Books, Graphic Novels and Adaptations, Movies and Television and was tagged with bill murray, City of Ember, Doon Harrow, Harry Treadaway, Lina Mayfleet, Saoirse Ronan, steam punk, Steampunk, steampunk blog, steampunk books, steampunk movies, tim robbins. That looks worth watching for the visuals alone – thanks for pointing it out. Plus Bill Murray’s always great. I hadn’t read the books yet when the movie came out so I was also drawn in by the visuals. At the same time, I was watching it and thinking, “this must have been Hollywoodized” and I started to pick out things I thought were added to make it an exciting movie rather than a good novel. It turns out I was totally right about those details and it has made me look at movies in a different way going forward.